Getting your tailoring right is no simple matter, which is why we’ve carved onto stone the 10 unbreakable commandments of wearing a suit and wearing it well. Always rest your suit at least two days between wears. This will give fabric which has stretched in the knee, in the sleeve and elsewhere a chance to relax and return to its original position. It will also prevent wear on stress spots. If possible always buy canvased suits as opposed to bonded. The natural fibres in half or full canvas are breathable and will easily return to their original state when they get wet. A bonded suit has been glued and will therefore go crinkly and crispy over time, which you absolutely don’t want. Always ensure that the cuff of your jacket sits no lower than the base of your palm and no higher than your wrist bone. With your trousers a good rule of thumb is to ensure that the hem kisses the top of the shoe without a break. Ensure that you’re wearing the right fabric for the season. Linen and cotton in summer (even certain types of super high twist wool will work), and cashmere, tweed or merino in the winter. Sweat patches and shivering are both unsightly and avoidable. Always ensure that the skirt of your jacket fully covers your seat. Short jackets are not flattering on anyone, even the skinny. A full length jacket with a nip at the waist will look flattering on pretty much all frames. There’s a reason why this has been a rule for years. Make sure that your shirt sleeve peeks out no more than a centimetre from beneath the cuff of your jacket. Too much of a gap will make the sleeve of your jacket look too short. If in doubt go made-to-measure or, if you can afford it, bespoke. There’s nothing better than having a suit cut to fit you. 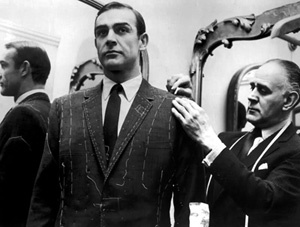 At the very least take your off the peg suit to a tailor and have the relevant alterations made. This is an inexpensive way of ensuring that your suit will look good no matter how much it cost you. If you can avoid it, don’t wear any type of boots with a suit. Box fresh white sneakers can work in the summer if worn properly (and you’re under 35), but in reailty you should only ever wear a suit with loafers, derbies, oxfords or monk straps. When it comes to choosing between double and single breasted suits, it’s really a matter of taste. As a rule, however, if you’re on the slightly shorter side or you are of a portly disposition you’re better off going single breasted as a double breasted style will truncate your frame. Single breasted suits look great on taller slimmer bodies, as can double breasted. Only ever wear a maximum of three accessories with your suit. If you’re wearing a three piece suit you must treat your waistcoat as an accessory and build your outfit around it accordingly. If you wear a three piece suit with a pocket square, a tie and a tie pin, it has the potential to look far too fussy. Three is the magic number. What do you think of when you think of a three-piece suit? 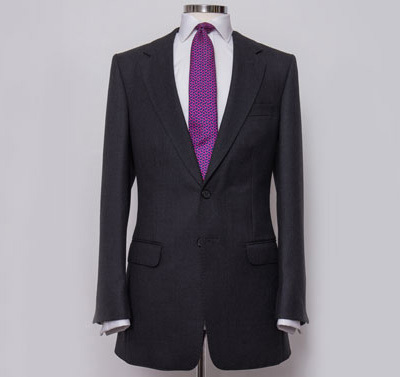 Street to Buy Handmade Suits in London - Bespoke Suits By Savile Row Tailors.